Flagship welcomes our customers to a new state of the art self-service platform. Interested in working with Flagship? Interested in enrolling in our preferred military lending program? Already one of our dealer partners? Find all applicable program information, active promotions, necessary forms, and/or contact information here. Have a loan with Flagship or through one of our affiliate partners? Find resources for managing your account, contact information, valuable tools and resources here. Your loyalty will be earned, every single day. We will provide a consistent, reliable, and competitive product bundled with unmatched personalized service. [PR] Flagship volunteers with RMHC in D.C.
Flagship volunteers lend a helping hand to D.C. families in need. As of the October 31, 2018 initial cutoff date, FCAT 2018-4 contained $239.97 million of receivables originated from both the Flagship Credit Acceptance (FCA) and CarFinance Capital LLC (CarFinance) branded origination channels and will contain $299.96 million after completion of the prefunding period. Flagship risk assessment team members, Senior Business Strategy Manager Tsungi Kajese and Business Strategy Analyst Taylor Shekels, worked with SMU Cox students to construct models using real-world, anonymized and non-identifiable loan application data. Flagship teams up with DataOceans to offer customers the most comprehensive and intuitive experience in our industry. The new digital account management portal offers dozens of new features and benefits on a mobile-ready platform. is as easy as click, sign, submit. By clicking this link you are leaving the Flagship Credit site and will be taken to the payment processing site . 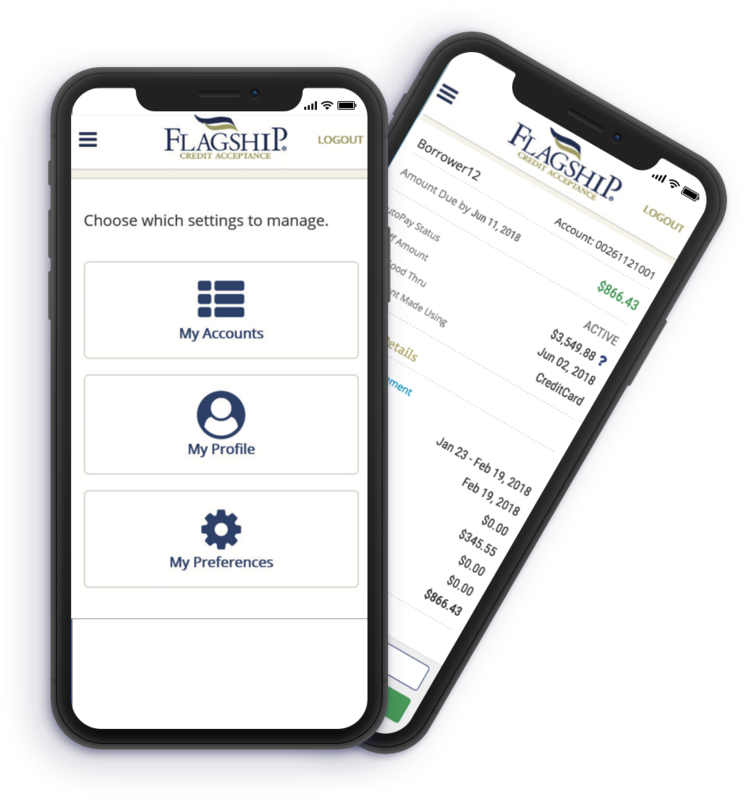 At Flagship, it's easier than ever to manage your accounts! Visit my.flagshipcredit.com to set-up your personal account management dashboard. Sign up for automatic payments and say goodbye to one-time payment fees and late payments. When you register to receive electronic statements, we’ll send them to your inbox, not your mailbox. Mobile friendly, so you can pay & view your bill at your desk or on the go! COPYRIGHT © 2019 FLAGSHIP CREDIT ACCEPTANCE LLC, NMLS #473165, NMLS CONSUMER ACCESS. ALL RIGHTS RESERVED. VERMONT - LENDER LICENSE AND VERMONT - SALES FINANCE LICENSE. Flagship Credit Acceptance, LLC ("Flagship") is committed to maintaining a culture of fair credit throughout the organization. In this regard, Flagship has developed a Fair Credit Program ("Program") that complies with all applicable fair credit laws and regulations ("FC Laws") and reflects industry best practices. Flagship is committed to comply with the letter and spirit of FC Laws. The goal of the Program is to carry out Flagship's commitment and be recognized internally and externally (e.g., by management, associates, customers, service providers, and the public) as dedicated to fair credit principles and demanding of compliance. The Program applies to all aspects of Flagship's operations (including reviewing, purchasing and servicing retail installment sale contracts whether for itself or others) and all services offered by Flagship, and across all of Flagship's credit operations, including marketing, underwriting, origination, processing, servicing, collection, loss mitigation, and payoff activities, and to all personnel who work for or on behalf of Flagship, whether as associates, officers, members of the Board of Directors, agents, representatives or service providers. Should you have any questions about the details of any of Flagship's policies, please contact us at 1.800.900.5150 M-F, between 9:00 a.m. and 5:00 p.m. EST. A borrower is more than just a credit score. At Flagship, we focus on the story behind the customer …and look beyond the number. Life happens. Whether low credit scores are a result of past circumstances, one-time events or just bad luck, Flagship offers multi-tiered pricing structures to finance borrowers across the credit spectrum. At Flagship we believe a borrower’s credit past shouldn’t dictate their future. Many borrowers need a second chance. We recognize the vast majority of persons with credit challenges are working hard to re-establish their credit rating. Each of our Credit Analysts are trained in "common sense" lending, a philosophy of reviewing all the circumstances and determining the appropriate deal structure for the specific borrower situation. Flagship maintains a very high standard regarding Fair Lending compliance, ensuring our customers are always treated professionally and consistently.